Gobba Gobba Hey | Gobba Sutra. I’m not sure why it was so hard to write those words, especially since on many late nights and just as many early mornings, I dreamed of being able to say that. But then again, I’ve always had trouble with goodbyes. And make no mistake, this is not going to turn out to be a blog post about my first farewell batch of gobs. This is it for Gobba Gobba Hey as we knew it. Yes, I’ll continue to post gob baking tips and even more gob recipes, but I’m definitely letting the baking business cool. If you’ve read this blog, or bought my cookbook, or spoke to me at an event, you already know why I started baking gobs. But in the past month, I’ve had several people asking why I’m going to stop, and I hope the following explanation will suffice. “Did it all just become too much?” was a question I was asked in an interview recently by my hometown newspaper. The answer, of course is, yes. I often felt I was in over my head, but just as often I felt a rush as I was swept along, deliriously, in the current of the scene that was developing in San Francisco back in Spring and Summer of 2009. Almost immediately I went from baking two dozen gobs at home to scaling up to several dozen in a commercial kitchen, often learning not so much from day to day, but from hour to hour. The pace was exciting. It was exhilarating to be a part of a burgeoning movement that was being created daily as other new vendors like myself stepped onto the streets to sell their wares. But it wasn’t just the people making the food who were responsible for the new scene. The food bloggers, yelpers, local media, Twitter followers and even the curious neighbors who came to see what this mobile buffet was all about, all were part of it. We all made this thing happen. And having just relocated to San Francisco several months prior, this was my new community in more ways than one. It grew quickly into something much bigger than I’d anticipated. While perspective means being able to see where you are, and where you’ve been, it also means having the ability to see where you are going. My main goal in baking it to the streets was to eventually have material to write about, and that was always in perfect focus. But to suddenly have an enterprise to which people were turning for hundreds, and on occasion, thousands of gobs, was never anticipated. I needed help, but I wasn’t prepared to bring another person into the kitchen full time with me for many reasons. For starters, I had to pay a rental fee for the kitchen. To have a second party in the bakery, I would incur an additional charge for having that additional body on the premises. And then of course I would need to pay that employee a salary. This was all before figuring in the cost of ingredients. I am proud to say that if you ever bought a gob from me that you consumed a product that was approximately 90% organic. To the best of my knowledge you never once ingested anything that had GMOs or pesticides. The packaging your gob came in was environmentally friendly and compostable. Unfortunately, keeping that kind of a standard costs a lot of money; more money than a $2, then eventually $3 product that required nearly three hours of rented kitchen time for the production of three dozen, can bring in. So it was time to turn off the ovens. This year’s Twelve Gobs of Christmas seemed like a good way to bring the past 33 months to an end. So instead, I’ll use this. And San Francisco gobsters? You can click here. It’s been a great run. I hope to run into many of you at future food events. Look for me, this time, on the other side of the line. Until then, thank you all. Now if you’ll excuse me, I have several dozens of gobs to deliver. Last Chance For Gobs. Ever. Well, it’s true. Saying goodbye isn’t easy. I’ve been thinking for awhile now about what I would write when the time came to wrap things up here in gobland, and honestly it’s been more difficult than I thought it would be. I’m still at a loss for the right words to express my gratitude without getting all mushy. So I’ve decided to take the easy way out, at least for this post, and save my farewells for later. As of November 14, you will no longer be able to purchase gobs online. The Gobba Gobba Hey store at Foodzie.com will close and the links below will no longer be active. So here is your chance to order the following gob boxes for the holidays. If you are interested in purchasing the Gobble Gobble Hey Turkey Day gob box, containing Spiced Pumpkin gobs, Orange Cranberry gobs and Chocolate gobs with vanilla frosting, please click here. It will ship on Monday, November 21st. You can also order for local delivery in San Francisco. They will arrive that same day. If you are interested in ordering The Twelve Gobs of Christmas with a shipping and local delivery date of December 7th, please click here. Or, if you wanted to purchase The Twelve Gobs of Christmas and have them ship or deliver on December 14th, please click here. Because Christmas Day falls on a Sunday this year, and because ample time is required for shipping during the busy holiday season, Wednesday, December 14th will be the last day The Twelve Gobs of Christmas will be shipped or delivered. As always, the number of available boxes is limited. Until my final post, whenever that will be, thank you all for your love, friendship and support during these two and a half years. It’s been a wild and wonderful ride. Now, hurry! Before those Foodzie.com links expire!!! I’d been selling gobs in San Francisco for about three months in the middle of 2009 when I received an email from a woman named Devon asking me if there was any way at all I could bake and deliver my product to her boyfriend, Ryan. She went onto explain that he worked at Twitter, had eaten the confections I’d delivered to his office and that ever since he “couldn’t stop talking about them.” Ryan’s birthday was fast approaching, Devon said, and she was hoping that she might be able to order a dozen or so as a surprise for him. I wanted to help her out, I really did. But I was swamped. I had recently started selling Gobba Gobba Hey gobs at the Ferry Building’s Thursday Farmer’s Market and I was also baking for my first mega food event, the inaugural Eat Real Festival in Oakland. I was in over my head. I had only recently started scaling my recipes – taking the formulas that I’d written and beefing them up so that they could go from the home made batch that made about three dozen to doubling and tripling the output without losing the flavors that people loved. I had no choice but to write back to Devon with my apologies. I explained my situation. I told her I already had more business than I was capable of handling and that as much as I wanted to help her out, I was already operating at my maximum capacity. I read and re-read that email several times. You probably know where this is going, especially if you arrived at this web site because you ate one of my confections at Ryan’s and Devon’s wedding this weekend. There was something about Devon’s email that kept drawing me back to her request. And I found myself unable to say no. Even though I’d never met Devon or Ryan, it was obvious to me that they were very much in love. I admired the way Devon searched me out based on what little information she had gleaned from Ryan. I was a very small baking enterprise with an oddly-named product and a confusing name. Even though my business and reputation were both growing, I was still far from being easily accessible. Yet she found me. Anyone who went to this much trouble for their significant other obviously cared very deeply for them. I had to find a way to make this delivery happen. I delivered gobs to Ryan the following week, and when I did, I let him know that I could truly get a sense for how strong his and Devon’s relationship was just from her messages, not to mention her efforts to find me. It was about two months later that I finally met Devon in person when she and Ryan attended an event at which I was selling gobs. Within a few seconds of watching them interact with one another, I could tell they were more than just boyfriend and girlfriend. They were best friends. They were each other’s matching half. So when they asked a few months ago if I would bake for their wedding, which just so happened to again fall on what would be the busiest weekend for my business of the year, I couldn’t say no. They requested a flavor that joined foods from their respective home states, Maine and Michigan, into one new creation. Devon wanted blueberries, and Ryan requested cherries. The recipe follows. I hope you enjoy this flavor. You can make it as many times as you like, but I will never bake it for anyone else again. Ryan and Devon, this is for you. I thank you for your support, and I hope you have many happy, healthy and prosperous years together! 1. Preheat oven to 325 F. (If your oven runs cool, you can go as high as 335.) Separate the egg yolks from whites and let both come to room temperature. Cream butter in standing mixer (or with beaters.) Sift sugar then add to butter and mix until fluffy. Add vanilla extract and mix on medium high for one minute. Add the egg yolks to butter, mix on medium high til sugar and butter mixture turns the color of the yolks. Add egg whites and beat on medium high almost until peaks form. 2. While butter and eggs are creaming measure out all dry ingredients, then sift together. Turn mixer to low. Add one third of flour mixture to butter and eggs, then mix on medium til incorporated. Add half cup of butter milk, and mix on medium high. Scrape sides and bottom of bowl with spatula to scoop up any butter that might be sticking to bottom. Add second third of flour mixture to batter, mix on medium til incorporated. Add remaining buttermilk and sour cream. Mix on medium high. Slow mixer speed to low, add lemon zest, then mix on medium high for one minute. 1. In a mixer cream butter with almond extract. Add cubes of cream cheese one or two at a time to butter, on medium speed, to fully incorporate. 2. Turn mixer off. Scrape the sides of the mixing bowl with a spatula to make sure the almond extract, butter and cream cheese are melding together. Set mixer back on low speed and slowly begin to add 1 TBS lemon juice, followed by 3 TBS cherry-blueberry syrup. Turn mixer up to medium, allow to run for about a minute, then turn up to medium high for the same length of time. 3. Turn mixer back to low. Begin adding the confectioner’s sugar 1/4 cup at a time, mixing on medium speed after each addition. When all sugar has been added, check the consistency of your frosting. A spoon or fork inserted should pull a peak out of the batch with it when extracted. The frosting should be almost the consistency of whipped cream. You can add another TBS or two of the syrup if you like, and another TBS of the lemon juice. Add only 1 TBS at a time, and mix well. Check consistency of your frosting. Just be careful not to over-beat the mixture as it will turn soupy. When frosting is of desired thickness, and flavor, set mixing bowl in fridge for about 20 minutes. 4. As frosting cools in fridge, take the gob domes that have also cooled and begin flipping them over onto their backs, flat side up. Match like-sized domes so that you have two halves side by side. Pair up remained of the batch in this manner. Take frosting out of the fridge and begin scooping preferably 1 TBS, but up to 2 TBS of frosting onto one of the flipped-over gob domes. Set its matching half on top of the frosting, and press down giving a small turn to create what will look like a cake sandwich. Congratulations! You’ve made your first gob. Do this with the remaining domes until each pair has been frosted. Put tray of completed gobs in the fridge, covered tightly with a sheet of plastic wrap. Allow to sit at least an hour so that the flavors from the frosting can start to permeate and moisten the cake halves. Serve either at room temperature of chilled, according to your tastes! 1. Wash berries and cherries, removing stems (and pits from cherries.) Coarsely chop the cherries. Place everything but the lemon juice in a small saucepan begin to bring to a boil over medium high heat. Press down on the berries and cherries to release their juices. Stir often. When the mixture comes to a boil, lower heat and allow to cook and thicken over a low flame for about 20 minutes. If it’s bubbling gently along the sides of the pan that’s fine. Stir frequently. Turn off the heat, stir in the lemon juice to mix thoroughly and remove from the stove. Set aside to cool. 2. When the syrup mixture has cooled, strain to remove pulp, vanilla bean and any lemon seeds from the pot. Keep syrup in the fridge until ready to use for frosting. 3. Use any remaining syrup in your favorite vodka or bourbon cocktail with a squeeze of lime juice. Just to remember to toast Devon and Ryan each time you raise your glass! Introduce yourself. Make friends. Be polite. And let your new home introduce itself to you. That sentiment, as expressed and experienced by Frances Mayes’ character in Under The Tuscan Sun, became a manifesto of sorts for me back in late 2008 and early 2009 as I settled into a new home and a new life. Whereas Mayes ended one chapter of her life in San Francisco, I was beginning a new one in that city. And while her relationship in the tale had ended, mine was still very much intact. But make no mistake. I was starting over in practically every other way. I didn’t have to go any further than my own kitchen to be reminded just how different my life now was. A fixer-upper, which we’ve often referred to as a tearer-downer, our new house presented unique challenges daily. Heavy or quick footsteps across the sagging kitchen floor were capable of disrupting contact points in the refrigerator’s wiring triggering a flash of blue sparks and the occasional white wisp of smoke. Light fixtures had been held in place with scotch tape, the removal of which left greasy, ghostly silhouettes on the wall and ceiling. And of course there was the cheese, or rather the smell of it, that came from the cabinet under the sink. My new home was introducing itself to me, alright. And I was finding it increasingly difficult to be polite. Of course the sinking economy was likewise tugging down my mood. I’d spent the better half of 2008 promoting my bookThe Warmest Room in the House – a social history of the kitchen’s role in the American home – and when I finished, I found that it was a much different world for a freelance writer. Outlets and opportunities were disappearing rapidly as newspapers and magazines were folding. I was scrambling to find topics to pitch to a dwindling number of editors just as an ever-increasing number of out-of-work writers and journalists were doing the same thing. Jobs were scarce, but I had plenty of work in front of me. I confronted it each morning as I shuffled into the kitchen to make my first cup of coffee for the day. Without much of a budget to transform the room at the time, I rolled up my sleeves and made the room as welcoming as possible. As our kitchen became more hospitable, I started using it more. The homesickness I felt, missing my family and lifelong friends on the other side of the country, was abated by cooking the meals and foods I’d shared with them over the years. But I also started adding new foods to my cupboards, tweaking old recipes with these ingredients. I’d walk to the weekly farmer’s market and return home with a whole new world awaiting me in the herbs and greens and seasonal produce I’d stuffed into my bags. It was during this process of remake/ remodel that the recipes in Gobba Gobba Hey: A Gob Cook Book were written. Baking gobs was something that helped me feel a connection to my past, and the use of fresh, seasonal ingredients allowed me to discover one of the many wonderful offerings of my new home town. Each recipe in the book, from the first revisiting of Chocolate with Vanilla Frosting to the Matcha Green Tea with Lemongrass Ginger Filling all the way to the final notes on the Gingerbread Gob, tells part of my story of relocation and, dare I say, reinvention as an old family favorite helped me establish a new sense of home. I encourage you to read the entire book first before digging into the recipes. Take in each recipe header as if it were its own individual chapter, and the accompanying recipe the snapshot of that moment in time. Approached in this way, the book will introduce itself to you, politely. And while it may be irreverent at times, I think you will find that it remembers its manners when they matter most. How do you condense three hours of gobbing into four minutes of taping? Very carefully. 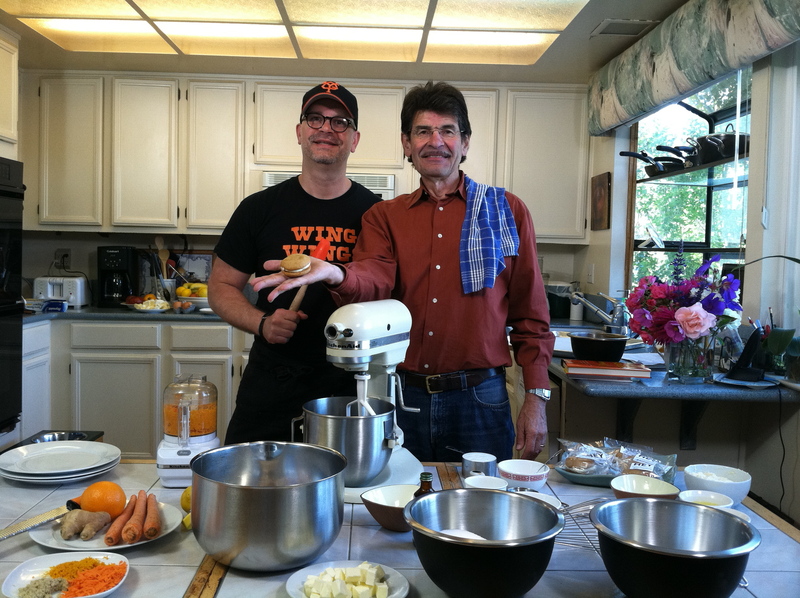 This morning I was in the home kitchen of Henry Tennenbaum, the host of KRON’s Saturday morning show giving him a lesson in high speed baking. It was a great way to start the day. You can see Henry getting schooled in the making of the Carrot Cake Gob recipe from the Gobba Gobba Hey Cook Book, as well as in the proper pronunciation of the word “gob,” Pittsburgh-style. Air time is Saturday, September 10, at 8 AM here in the Bay Area on KRON 4. And don’t forget I’ll be reading from my new book at Omnivore Books Saturday, September 10 at 3 PM and again at The Booksmith in the Haight, on Tuesday, September 13th at 7:30 PM. Lastly, many thanks to the kind folks at Bonny Doon Vineyards for co-sponsoring these events with Viognier Port! Here’s a quick round up of some early ink, cyber and otherwise, that Gobba Gobba Hey: A Cook Book has received in the past few days! Thanks for all of your emails, DMs, tweets, and facebook posts! Where do I turn for a high when I don’t want to break into my own sugar supply? Tamara Palmer asked me to round up some of my favorites sweets in San Francisco. If you’d like to get your hands on a copy of Gobba Gobba Hey: A Cook Book to call your very own, click here. Until next time, thanks for the continued support. Happy Gobbing! So. You bought the book. Now what? Here’s how to make perfect gobs every time! First you had gobs from Gobba Gobba Hey. And then you bought the book. And now you’re ready to bake. So. What happens next? I wondered the same thing myself over two years ago after my parents gave me a recipe for gobs. It wasn’t that there was anything especially complicated about the ingredients or the steps. But some of the measurements threw me off a bit. “Why do the steps say ‘2 to 4’ tablespoons of milk? And what’s up with this: ‘1 cup of water, use sparingly?” I asked my Mom. “Keep an eye on your batter,” was her reply. My parents’ recipes, and their instructions, reminded me that you can put a tablespoon in a drawer, but you can’t make a cook use it. But if there was one thing I learned from watching my family cook, they didn’t always need institutionalized measurements yet their meals were perfect almost every time. My grandmother and both of my parents cooked in a very instinctual way. You listened. You sniffed. You watched. You tasted. If you were stove-side with them, you received an incredible education. But if you were on the other side of the country, on the other end of the phone line, things could get complicated. So when I began writing down my own gob recipes, I kept this in mind. In the past I’d often jotted things down on scraps of paper with notes that made perfect sense to me – just like my parents’ recipes did to them – but could I really ask people to “Mix until you hear a thwopping noise” when instructing them to make frosting? In a book, probably not. But in a blog post? Yes! In that spirit, here are my Top Five Tips for making perfect gobs every time! 1. Listen. Food is very noisy. And I don’t mean the sounds made by the equipment and utensils we use to make it. I mean ingredients, when mixed together, can be almost musical. When you’re making your frosting, listen for a soft “thwopping” sound as the confectioner’s sugar thickens the dairy. It will leave peaks. It will be thick enough to hold onto an inverted spoon. But for me, that sound is what I always listen for. If you need to add an additional tablespoon of sour cream or one of the flavoring syrups, go right ahead. If it appears too loose you can always firm it up by adding another tablespoon or two of confectioner’s sugar and sticking the mixing bowl in your fridge for twenty minutes. Just be careful not to over mix it. Cream cheese can separate and then all bets are off. 2. Sniff. A lot of the recipes call for cinnamon or ground ginger or ancho chile powder or other ground aromatic spices. I sift mine together with the flour into the bowl, but the way I can tell if everything has been properly integrated is that the light powdery smell of flour is no longer present when I’m whisking. 3. Watch. This is where my parents would say “Eyeball the batter.” I’ve replaced the “1 cup of water, use sparingly” in my batter recipes with two tablespoons of sour cream (in recipes that needed it.) If you’ve added it and your batter still seems too thick, don’t even hesitate to plop in another tablespoon of the cream or buttermilk. You want to be able to dig out a thick scoop of batter, but you don’t want it too dense. Likewise you don’t want it too runny. Here’s what to look for: After you’ve added all of your ingredients, turn your mixer back on, let the paddle or beaters whir around a few times, then turn it off. The batter should very, very slowly start to drift from the sides of the bowl back to the center. SLOWLY! If it’s stationary, add the above mentioned additional tablespoon of sour cream or buttermilk. If it’s moving like a mudslide, add another tablespoon of flour. 5. Taste. Your gobs will be delicious! I know it! Follow the recipes, but don’t be afraid to ad lib a little! If you want to dial back one of the spices, and pump up another, go ahead. Baking might be an exact science, but gobbing isn’t! Enjoy! Sweet Release! The Gobba Gobba Hey Cook Book is NOW in Stores! Gobsters of the world, rejoice! The Gobba Gobba Hey Cook Book, a collection of 52 recipes and stories from my first year of gobbing in San Francisco is available for purchase online and in book stores NOW! Over the next few days I’ll be updating this site with news about book signing events in the Bay Area as well as sharing some how-to-tips to help your gobs turn out perfectly every time. For now, here are some events to put on your calendar. I hope to see you at one, or two, or even ALL of these! 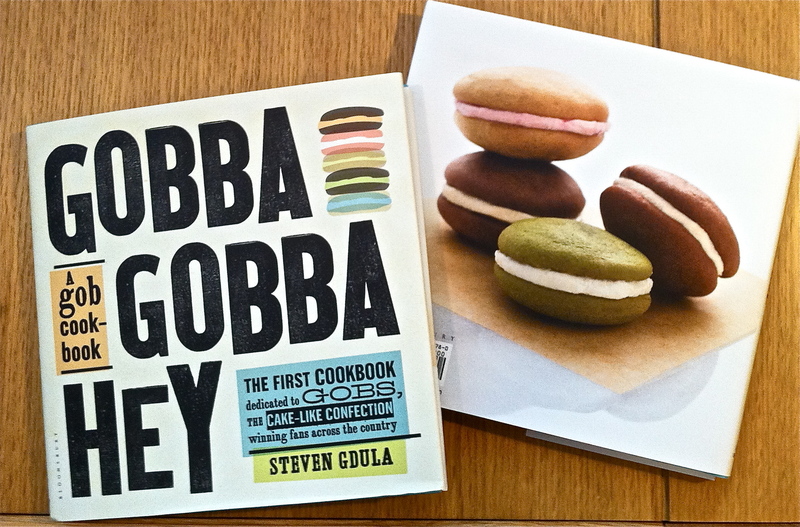 Stop by Omnivore Books on Saturday, September 10th, where I’ll be signing copies of the Gobba Gobba Hey Cook Book. I will also be sharing stories from my first attempts at selling gobs on San Francisco’s streets, talking a bit about the regional significance of the gob and its role in American foodways, and of course serving gobs! Come on over to the Haight on Tuesday, September 13th for some neighborhood-appropriate tales from my days of gobbing the streets of San Francisco! In addition to signing books, I”ll have buttons and T-shirts to give away. And, if all goes as planned, I might even have a new flavor of gob on the menu that night! The Eat Real Festival will always hold a special place in my heart. 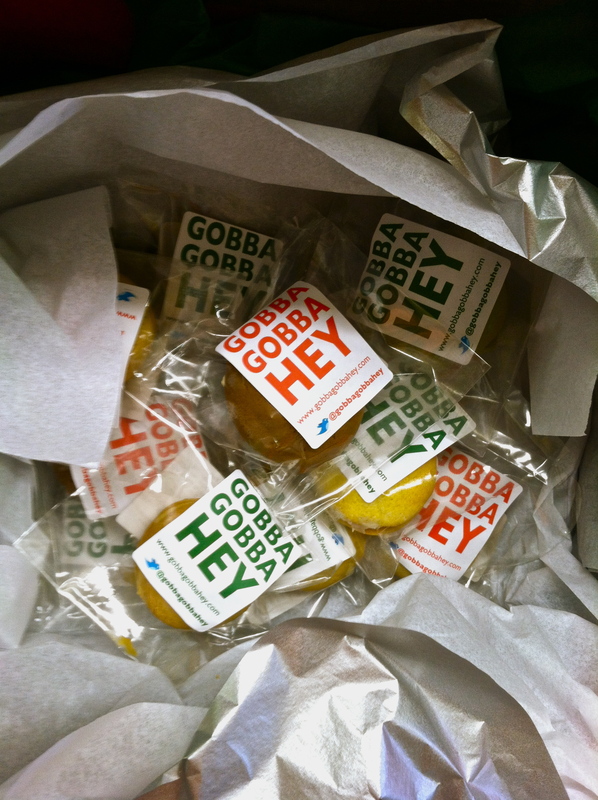 I’d only been baking gobs for about two weeks in the Spring of 2009 when I got an email from one of the event’s organizers asking me if I might be interested in coming over to Oakland to sell gobs for a new weekend-long event celebrating “real food.” I jumped at the chance! This September will mark my third year of participation as a vendor and my first year as a panelist for LitFest! I’ll have books to sign, stories to tell, and yep, gobs to gulp! Gobs on Film (Two Years Later) Gobs on Film. Good people of the Bay Area, please lend me a hand. And if you can lend two, well, that would be even better! As this post’s subject heading, and tweaking of the Duran Duran song’s lyrics suggest, the gobs are ready for their close up. Gobba Gobba Hey: A Gob Cookbook will be officially be released by Bloomsbury, USA on August 31. The constant need to feed info into the Twitterverse and blogosphere has no doubt made this book seem like it’s been released three or four times by now, but I assure you, that’s all just been part of the process. Now that the big moment has almost arrived, there’s one last bit of PR that has to be teased out: Gobsters of the Universe, I want to make you all stars! Or at least your hands. I will post the time and date and location soon. It will only take a few minutes of your time, I promise. No cattle calls, no violations of SAG laws for the extras. You’ll get in, get out, and walk away with a tasty treat, not to mention bragging rights! Thanks in advance for your help and continued support! And until next time, here’s a pic of the finished book. Check out the gorgeous back cover photo, courtesy of Mr Jun Belen. It’s the “Honest, Mom, I Didn’t Forget!” Gob Box! Admit it. We never intentionally forget to send a card or a gift for a birthday, an anniversary, or even Mother’s Day, but let’s be honest: It happens. And try as we may, there’s no excuse or apology that we can offer that is ever really good enough. 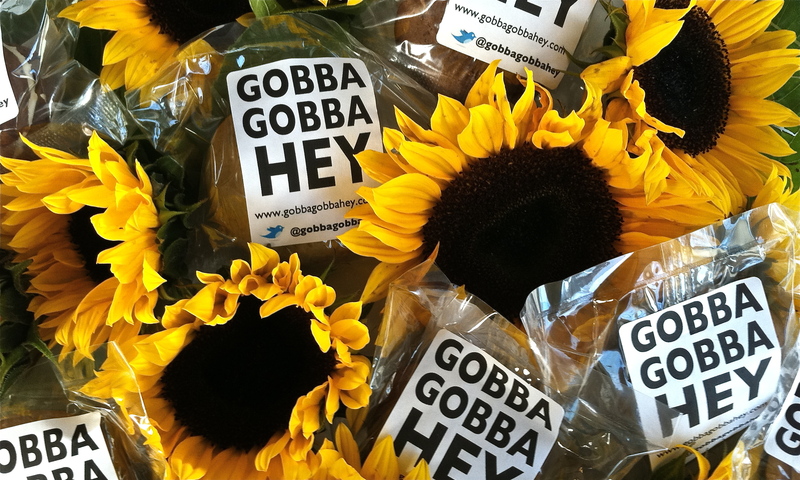 So this year, forget saying it with flowers: Say it with gobs! If you didn’t get a chance to get something in the mail to your mom, let Gobba Gobba Hey smooth over your family relations. For the next two weeks I’m offering the “Honest, Mom, I Didn’t Forget” Gob Box. Every box will include a half dozen of the Chocolate Gobs with Vanilla Frosting and a half dozen of the Orange Cardamom Ginger Gobs with Saffron Frosting. I’ll even include a note explaining my busy baking schedule to help take the blame off of your shoulders. 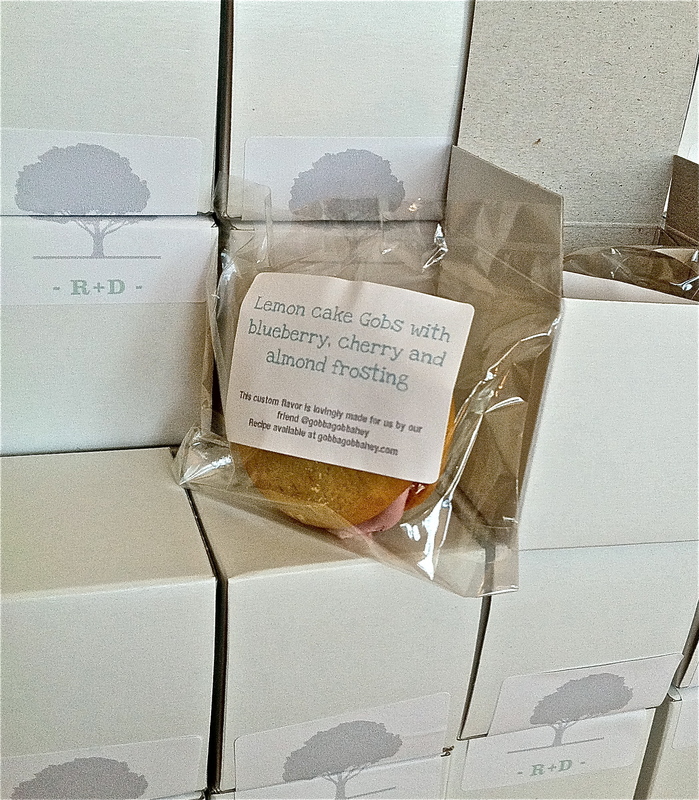 Your Mom will appreciate the extra effort you made to remember her with a box of tasty hand-made treats! I’ll have a fixed amount available for shipping and delivery on Wednesday, May 11 and again on Wednesday, May 18th. Please specify which date you’d prefer when ordering! Supplies are limited so act quickly!